Ohana is quite possibly the most popular restaurant in all of Walt Disney World. Located at the Polynesian Resort it is an easy journey from anywhere on property. Ohana highlights Polynesian inspired food ,with items such as pot stickers, teriyaki noodles and grilled meats. Don’t forget with it’s proximity to the Magic Kingdom you can watch Happily Ever After while dining if you’re lucky enough to get an 8 pm dining reservation. Ohana isn’t just a restaurant it’s an experience. The real question remains, is it just hype? Or is the food really as good as everyone says? Ohana is an All You Care To Eat restaurant located on the second floor of the Great Ceremonial House at the Polynesian Resort. If you arrive via Monorail Ohana is on the left hand side, located next to Tambu Lounge. 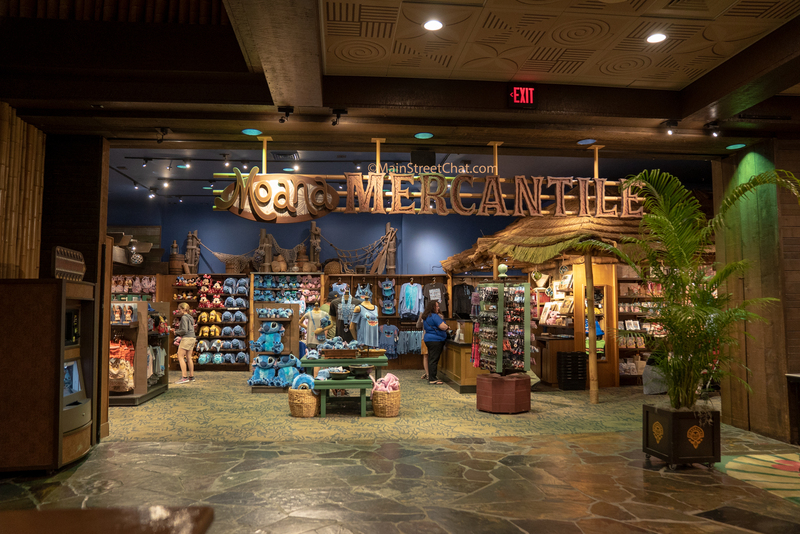 While the restaurant is on the left side of the Lobby, the Check- In kiosk is located across from Moana Mercantile and the elevators on the right side of the building. Usually, there will be a line for Check- In, so we really recommend showing up at least fifteen minutes before your check in time. Ohana is very popular so waiting up to fifteen minutes (or longer) to be seated is not at all uncommon. Ohana has a very homey ambiance, with dark wood accents and dimmed lights. While you are enjoying dinner there is a lot of crowd interaction with a Master of Ceremonies who sings while playing the Ukulele. They acknowledge all couples celebrating their Anniversaries and Birthdays. They also lead the children (and any willing adults) in a Hula lesson. What’s great about Ohana is you can decide to participate if you want too or stay at your table to observe. Introverts can eat here without needing to worry about being singled out. Be prepared to eat! Ohana is a five course meal. This includes, Bread service, Salad, Sides, Meat, and Desert. The Bread Service is a Hawaiian Sweet Bread with coconut and Pineapple. It is served with a sweet macadamia nut butter that is astounding. Elyse has a Pineapple allergy and the night we were there they did not have a substitute bread offering available. They just asked that Elyse refrain from eating it. 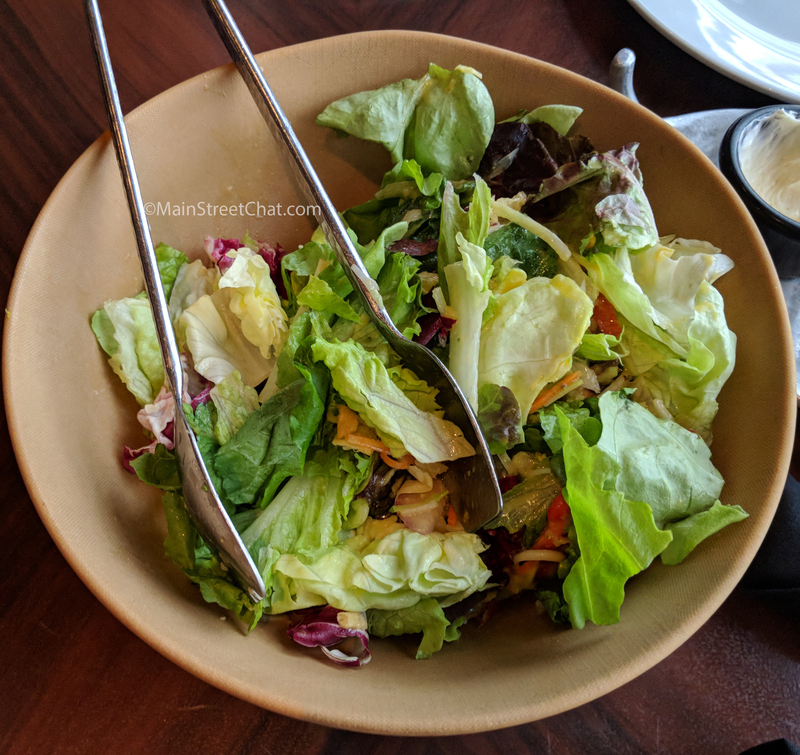 The Salad is a tossed green salad with wontons, bell peppers, and a lilikoi dressing. In all honesty the salad was the worst part of the meal. Wilted was the best way to describe the greens and while the dressing was good it didn’t make up for the quality of the greens. The appetizers and sides are served at the same time in a large steel bowl. Pork dumplings, teriyaki noodles, coriander honey chicken wings, and steamed vegetables. 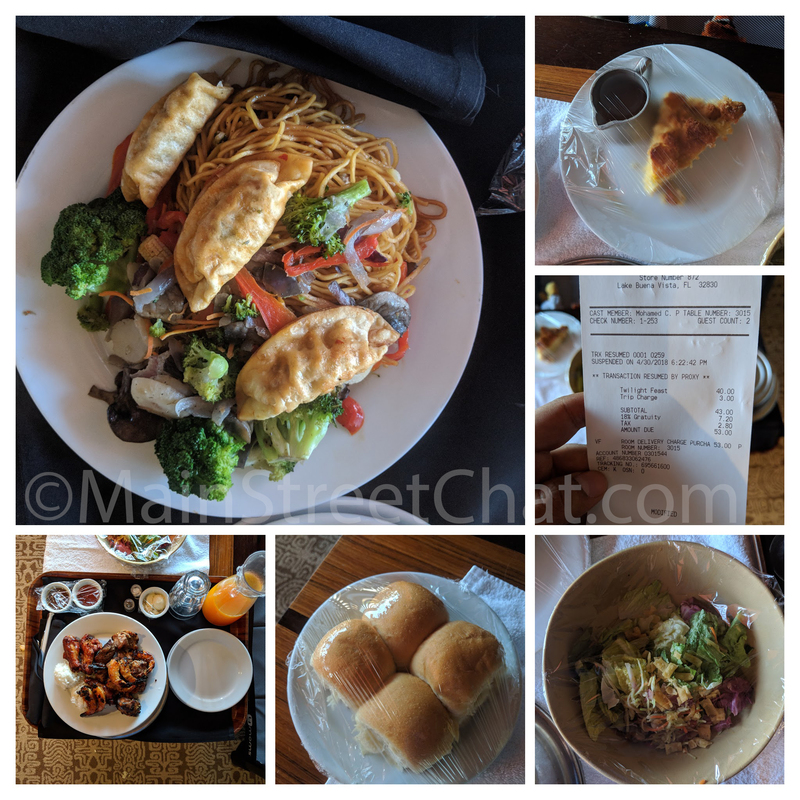 We have eaten at Ohana three times (once in house, twice as room service) in the past six months and can say that consistency with these items can be an issue. The pork dumplings have always been great. Teriyaki noodles can be a hit or miss. Mostly they have been a hit with a great balance of salty and sweet. The coriander honey chicken wings are perfectly sticky and are just zesty enough. The biggest surprise while eating at Ohana was the quality of steamed vegetables. They have been cooked to perfection every time we have eaten there and no one ever complains about having to eat your veggies. 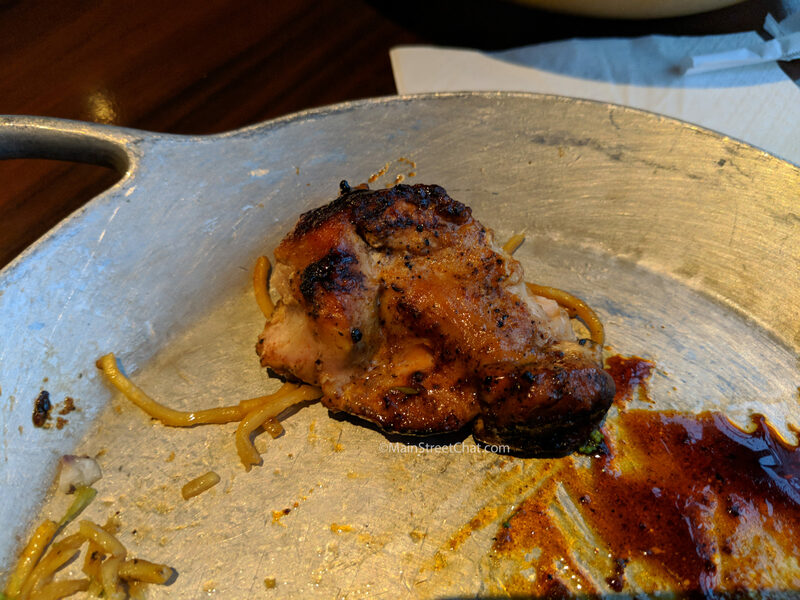 The meats are brought to your table on skewers by servers. Everything is marinated and wood grilled so you end up with some wonderful flavor profiles. The Chicken is in a sweet and sour sauce. The steak is Szechuan inspired, while the shrimp is a peel to eat and is supposed to be marinated in a spicy sauce. 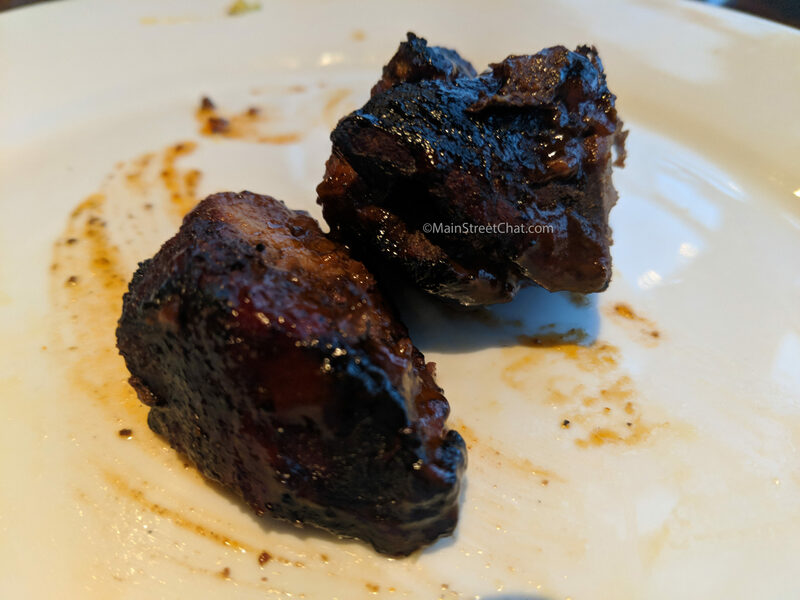 The meat has always been the biggest letdown for us at Ohana. It is never consistently good. The Chicken is always pretty solid and has a nice wood smoked flavor to it. The marinade complements the chicken nicely and doesn’t draw from the smoked flavor. If you asked anyone in our family we would all say that the chicken is our favorite. The Shrimp has no discernable flavor to it. It’s supposed to be marinated in a “Spicy” sauce but we have never been able to distinguish a marinated flavor. While the shrimp is good, Elyse hates having to peel the shrimp and often wont eat it. It’s just a personal preference thing but if you aren’t into peeling your seafood, this might annoy you a little. What can we say about the Beef? Hands down this is the one item at Ohana that always leaves us on the fence, is it good or not? We still haven’t made up our minds. Sometimes the marinade comes through full force and it’s a bit too much, other times the meat will be tough and gristle filled. Every once and a while you’ll get a piece that is delicious. Like stated earlier, sometimes consistency is an issue. Now when we get to the Dessert portion of the meal we fully admit that this is going to sound gushy. The bread pudding is to die for delicious. It’s a pineapple bread pudding (food allergy be danged I’m still going to eat this. YAY BENADRYL!!!) with a banana caramel sauce and vanilla ice cream. It’s one of our favorite deserts. It’s delicious. Save room for this, it needs to be savored and enjoyed with a nice cup of coffee. We had an early reservation at 5 pm. Make sure to check MyDisneyExperience regularly while you are in the parks. This was a last minute reservation that we booked because someone had cancelled. For our party of three we were sat at a table meant for two. We really weren’t happy with this but our options were limited. 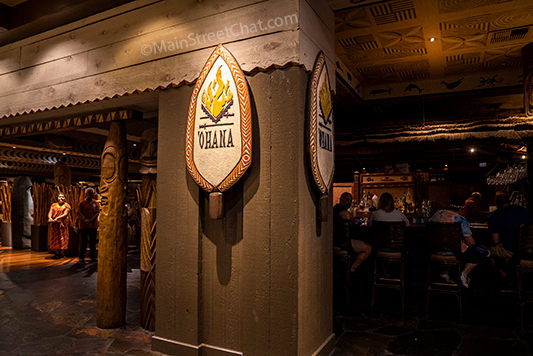 Ohana is a popular location for large groups so seating is limited for smaller parties. If you are traveling with a toddler be prepared for a never ending game of “honey please put that down”, followed by what type of alcoholic beverage does your toddler think is pretty. (Kaitlyn would not leave the beverage menu alone). The volume of guests at Ohana makes it difficult for this meal to be quick. You receive the courses family style and then have long periods between any servers coming back to the table. This really depends on your wait staff and we think this ties back to our group size. 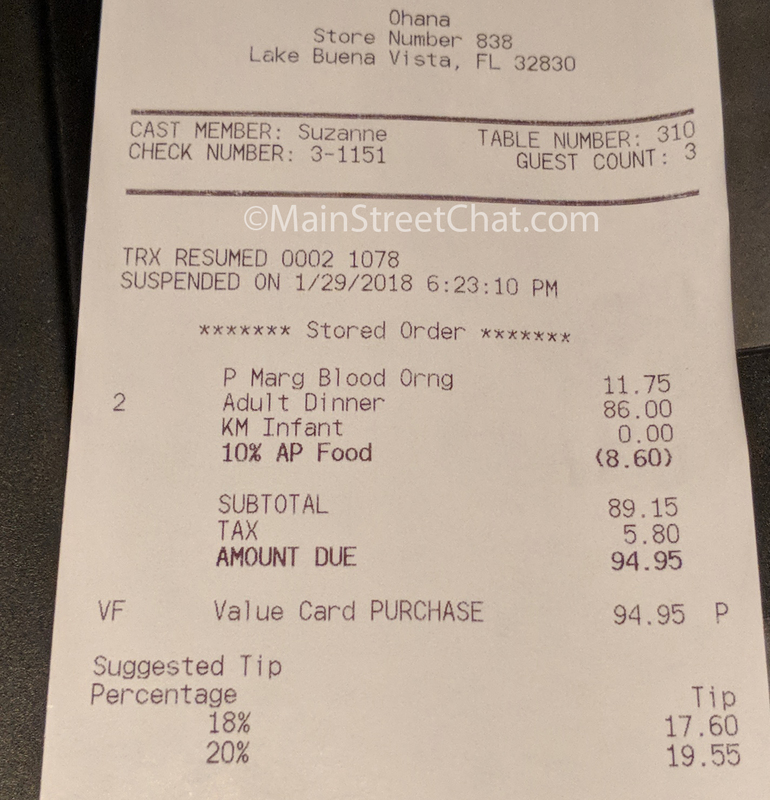 Since so many large groups eat at Ohana it’s understandable that servers are more interested in these groups because the tip will be much more worth their time. We aren’t suggesting that service is always going to be bad if you are in a small group, this was just our experience. Our server was by no means bad, she just didn’t have the time to check on us very often. We wanted to take our desert to go, and eventually did, but it took a long time let her know. It took us two hours to get through the appetizers and meat courses. This would be fine with older children but as I’m sure most of you know long periods of sitting doesn’t always go well with a toddler. Kaitlyn had decided that enough was enough and started throwing a very loud tantrum. We had already been waiting for dessert for about half an hour and we just needed to leave. Elyse had to take Kaitlyn out of the restaurant and let her run around for a while. 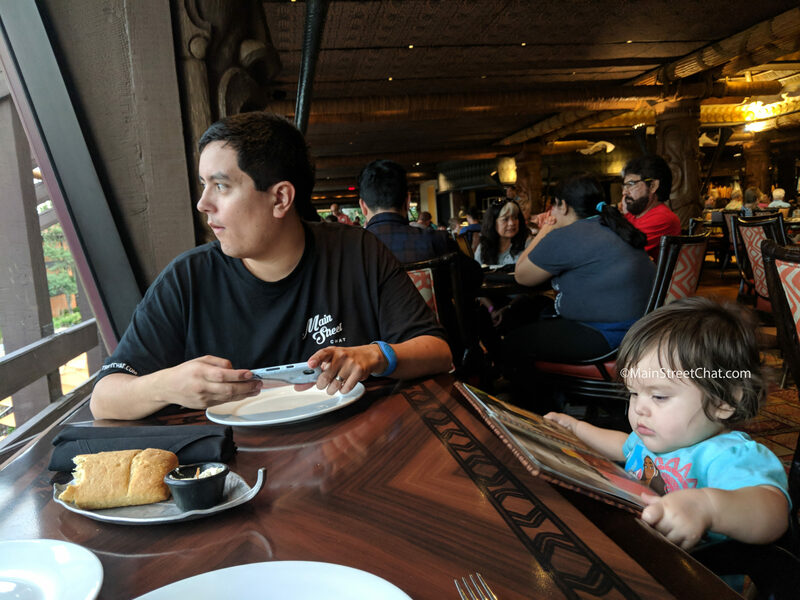 Ohana seems like a wonderful place to eat dinner if you don’t have a one year old. I can honestly say that the dining style wasn’t the best for our family because of the way things are served and the layout. It can take some time between courses and it ends up being a three hour meal easily. Kaitlyn just really isn’t ready to sit through such a long meal. So what do you do if your Toddler won’t make it through a long dinner? If you aren’t staying at the Polynesian Resort we recommend waiting until your child can make it through the meal. We won’t attempt to go back until Kaitlyn is about three. If you are blessed with a child who can fall asleep in any environment, go ahead and enjoy it. Luckily as Poly DVC owners, we get to stay at the Polynesian Resort pretty regularly. You can order Ohana for room service. It easily serves a family of three. We highly recommend doing this. Kaitlyn can enjoy an episode of PJ Masks and Adolfo and I can eat in peace. It’s the best of both worlds for us. A super yummy dinner combined with a little bit of quiet. Will we eat at Ohana again? Absolutely! The food is very good. I wont go so far as to say it tastes like an authentic Polynesian meal but it is delicious. If possible try to make a reservation where you will be at Ohana when the fireworks go off at the Magic Kingdom. 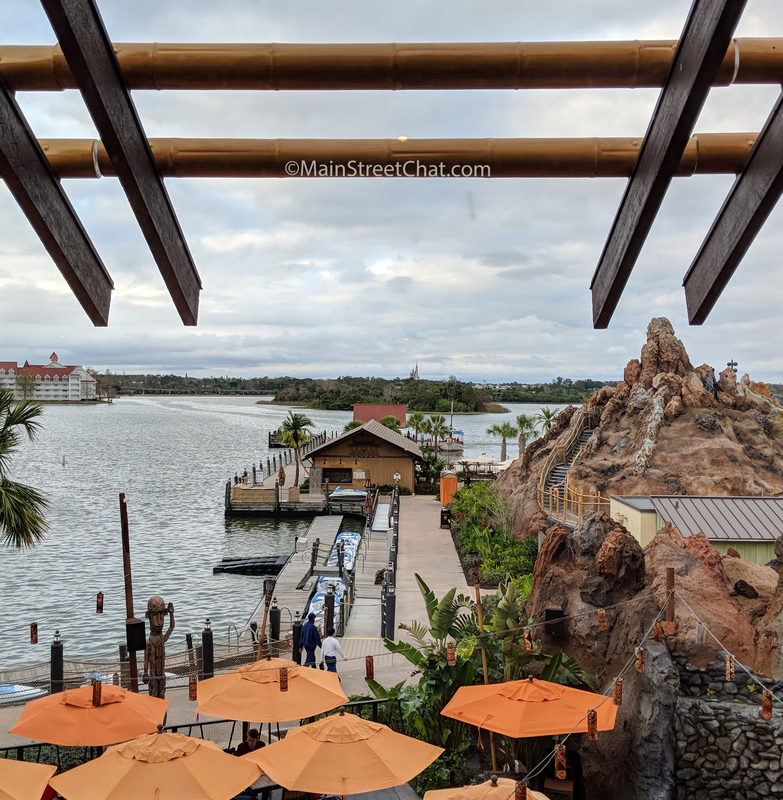 Ohana has a spectacular view of the Castle and overlooks the Lava Pool. We will never get tired of the view. Ohana is a very expensive restaurant and for two we spent over a hundred dollars. If all you want is a slice of the super delicious bread pudding make your way over to Tambu Lounge. You can order a slice of bread pudding without the expense of eating a whole meal at Ohana. Ohana does not seem like it is set up to handle all food allergies. Like I said they could not substitute the bread for Elyse’s pineapple allergy. Since this is a set menu many of the items are prepared in advance. We checked online and it doesn’t state that they are prepared to handle food allergies. We recommend calling to make sure that you can fully enjoy dining at Ohana. Kids menus are available! If you have a picky eater who hates Asian food, classics like chicken strips and fries are available. Hands down this is a great place to celebrate anniversaries and birthdays! Hope you like the article. Have any of you had good or bad experiences at Ohana? Comment below to tell us your story.